Another in our ongoing series of occasional reviews of cigars given to us by the good folks at Cigars Direct. Featured this time is the Gran Habano No. 5 Corojo, sent to us back in the Spring of 2009. 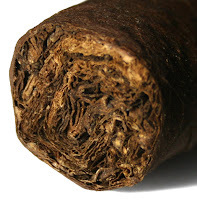 Produced by Gran Habano, it features a dark, rich looking Nicaraguan wrapper in a hefty Churchill shape. The current Cigar Aficionado rating for it is 90 (Aug, 2006). Following CA's 4-part rating system (Appearance & Construction, Flavor, Smoking Characteristics, and Overall Impression) I sat down to rate this cigar while enjoying a the champagne of beers, …that’s right a cold can of Miller. I know, I know, it’s not the fancy libation you had expected, but I was camping with my buddies… so give a guy a break! The flavors were bold and interesting and kept coming on; first licorice and cedar with full-strength and taste, and finally a hint of manure/silage during the second half (I never would have thought that I would appreciate a hint of horse apple in a cigar, but it really was tasty and rich!). My rating for the Gran Habano Corojo No. 5 Churchill is 88. Overall, this was a really good cigar, a nice long, rich smoke, and great for the price! Thanks again to Cigars Direct for giving us the opportunity to try this stick. Fortunately, they’re a bargain, so don’t hesitate to find out for yourself. © 2009 The Cohiba Club – All rights reserved.